Sparks Gift Wholesalers are one of the UK's leading gift wholesaler and supplier to gift retailers for over 20 years. Wholesale gift suppliers and distributors of Christmas ornaments, gifts, and christmas decorations including traditional wooden christmas advent calendars, traditional christmas wreaths and traditional christmas stocking fillers. Sparks Gift Wholesalers are one of the UKs leading Christmas product suppliers, and a premier supplier and distributor of imported wholesale Christmas gifts. We work with all the major christmas gift importers and manufacturers to bring you the biggest and best selection of trending decorative christmas products at low wholesale gift prices. Shop for wholesale christmas decorations, wholesale traditional wooden advent calendars, Christmas candles, wholesale festive and christmas wreaths, christmas lightup signs and much, much, more! Low minimum order and excellent customer service. 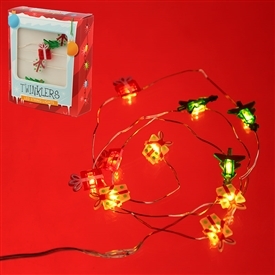 Here you'll find all of the wholesale Christmas products that Sparks Gift Wholesalers has to offer. We've got a stonking great variety of different Christmas items, with hundreds of lines in stock at amazingly low prices. You'll be pleased to find lots of really exciting new designs that follow the latest trends, as well as a heap of traditional Christmas mainstays in classic designs and colours, including advent calenders, wreaths, baubles and father christmas figurines. Find wholesale Christmas tree decorations and ornaments, light-up and LED novelties, gorgeous mugs and ceramics, reindeers and snowmen and santas all under one roof and of course ALL ready for you to order. Sparks are gift wholesalers and suppliers to all types of christmas gift traders and christmas gift retailers, from large garden centres to small independent stall holders, from online re-sellers to pop-up shop traders and everyone in between. Pair together our no minimum order policy (so that you can top-up little and often) with our super-low wholesale gift prices to see why we're the Chritsmas supplier of choice for hundreds of Christmas gift traders throughout the UK, Europe and Worldwide. From the beginning of August, right up until December, we'll be stocked to the rafters full of christmas ornaments, decorations, novelties, mugs, gift products and stocking fillers! LED Trees, Plaques, Xmas Signs, Cookie Jars, Santa Mugs, Soft Toys, Christmas candles and Tealights, Novelties, Christmas Stockings, and Gift Products! Shop for Shabby Chic Christmas Products and Natural Wooden Christmas Decorations.